Acronis Racing Week is back at the United States Grand Prix! This year we’re continuing the tradition of providing an exciting program to our partners and customers, filled with great events and networking opportunities — in partnersihip with our friends in Formula 1. Let’s kick off the US Grand Prix in style! Acronis executives and the talented Acronis Formula 1 event team welcome you to Austin during this networking Partner Welcome Dinner. Join us to meet with other attendees for the racing weekend, have a drink (or two) while you feast on a uniquely curated menu of the finest items Austin has to offer. This includes Cactus, of course! Never had cactus before? We’d welcome the opportunity to provide you with this once-in-a-lifetime experience! We know our guests are traveling from near and far, so please RSVP by sending an email to [email protected] if you are able to attend this dinner. 2018 has been an amazing year for Acronis. We are celebrating our 15 year anniversary! Please join us as we share everything we’ve been doing so far this year, and all the amazing things we have planned. This isn’t just a product sales pitch – we will focus on our various commitments and all the accomplishments we are doing with the help of our partners and customers. Spouses and guests of our partners and customers are more than welcome to join! The content will be relevant enough that you won’t get completely bored. We promise! At 10am sharp, we’ll board the bus and head to the track to ensure we are there in time for the final race! Please join Acronis and a special guest from Williams Martini Racing for this intimate, yet rowdy, evening to learn about how important statistics and data is in Formula 1. In addition to the lively discussion, attendees will learn how to dance like an authentic cowboy and watch our two speakers duel for the fastest hands in the Midwest! We will provide amazing libations with a special culinary experience with freshest ingredients! It’s certainly an event not to be missed! Business, Technology and motorsport media are the main audience for this event. Our partners and guests from the weekend are very welcome to join in the festivities. Please RSVP by sending an email to [email protected] if you are planning to attend this event. 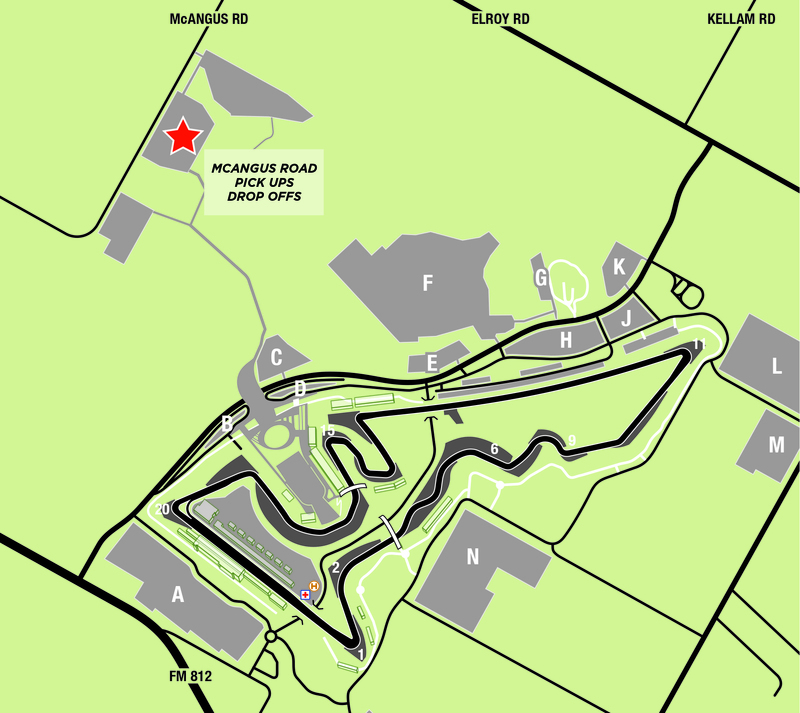 The US Grand Prix takes place at the Circuit of the Americas (COTA) track, which is about 30 miles from the heart of Downtown Austin. Acronis has arranged transportation to and from the racetrack Friday, Saturday and Sunday. Our bus will provide our guests with necessary transport throughout the weekend – this includes airport runs on Sunday after the race. Your Formula 1 hosts will help ensure you don’t need to use Uber or Taxis during the weekend, but in the off-chance you do, here are additional transportation details for COTA. Ride share and Taxis drop off and pick up from McANGUS Road (see the map below). Note this is about a mile walk from the race track. For reference, our seats are at Turn 1 and 15 and the main entrance is near Lot A. The US Grand Prix offers fans a unique musical experience following qualifying and the race with two concerts from the biggest names in entertainment. We know there are some guests traveling home following the US Grand Prix. Our bus will make an airport run right after the race for those guests needing to head out and then will drop off at our hotel for those not wanting to stay for Brittney Spears. For those guests that stay, the bus will take us back following the concert. Austin is the capital of Texas and is known for live music and BBQ. There are plenty of things to do besides Formula 1 while you’re in town. The Sheraton Austin at the Capital is the hub for the weekend’s activities. A majority of the guests are staying here and this is where the bus will pick up and drop off. The hotel does have on-site parking for those local attendees. If you are staying elsewhere, please be sure to meet up with the group at the Sheraton for bus pick up. If you have any questions, contact your Formula 1 host.